What’s the worst thing about being disabled? Is it the shameless staring? Is it that people assume you’re a bit thick because you can’t speak? Or is it the fact that your friends always take you to theme parks just so they can jump the queues? Think of it as a disabled FAQ. I've been asked countless stupid questions about my disability over the years, from 'What’s it like to be disabled?' to 'Can you really not speak?' In this book, I will use the best of these questions as a jumping off point to tell funny stories about my less than ordinary life. 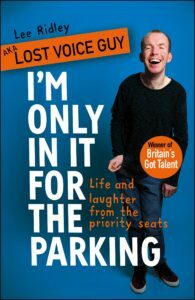 Pre-order your copy of I'm Only In It For The Parking now.